Well perhaps not if you’re Andy Robinson, drag racer extraordinaire. You see for Andy and his newly wedded wife Kate, the first day of the rest of their life together wasn’t going to be heading off on a typical honeymoon. 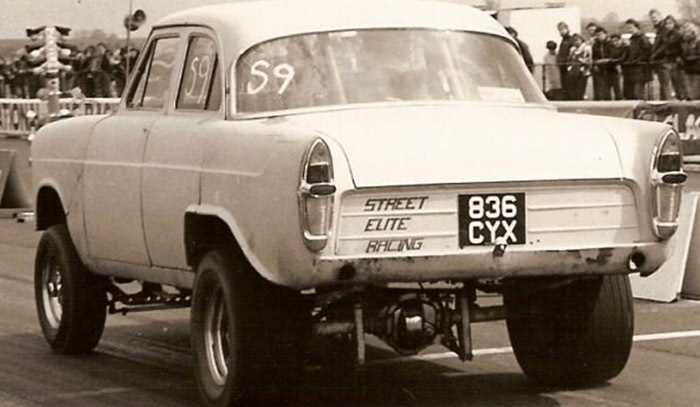 No, they would be making tracks for what was going to become Andy’s sort of second home, the Santa Pod Raceway in Northamptonshire, where he was due to race his Ford Zephr MK2 in the street altered class. And so the die was cast for their married life together. Thirty years on Andy has amassed not only two children who are members of his crew, but also an enviable record of winning within the racing class he has put his indelible stamp. Pro Mod. Pro Mods, or door slammers as they known in the ‘trade’, bear but a passing resemblance to the road cars they emulate, which in Andy’s current car is a ’69 Camaro. However while they boast opening doors like that of a standard street car, open the door and the fiction is laid bare because what lies beneath is an exotic concoction of a carbon fibre, titanium, steel and aluminium chassis. This in turn is powered by a supercharged methanol powered V8 hemi punching out in excess of 3,000 bhp. It’s a heady combination that has propelled Andy to the current British record of 5.867 seconds and a top speed of 246.37. But we’re getting ahead of ourselves. With married life in full swing, success wasn’t long in coming as he claimed his first title in 1981. Of course as so often is the case in motorsport, Andy started to hatch the plan for something better and faster and as it turned out revolutionary. The results was the first space frame chassied, road legal street car in the shape of a Chevy Monza. Amid some dark mutterings Andy persevered with the car that could well be seen as the shape of things to come in ProMod. That was followed by a two door Ford Sierra Sapphire which was his first full foray into the world of Pro Mod. The petrolhead will spot that the Sapphire was actually a four door car, never a two door, so once again Andy was forging a different path. Next came another slightly oddball car in the shape of a Rover 800 Coupe. Interestingly Andy got help from the factory itself in so far as they produced especially for him, a unique shell which had no sun roof. Shame that the manufacturers involvement stopped there as it could have been a seminal moment for the sport. But Andy undeterred pushed forward and campaigned the car successfully winning the national championship in 1997 and 1998. Interesting to note that back in 1997 the Rover ran a 6.787. Now just over twenty years later they’re dipping into the 5.8s. You can see that despite the massive effort to go faster, there are no easy wins in this sport. The next car in stable was the one that really put Andy on the map and indeed he still has a soft spot for, his Studebaker Commander. But the transition was not an easy one. The Rover which he had up for sale at the time, was totalled in an accident which saw him somersaulting and rolling his way off the end of the strip at Santa Pod. Amazingly he escaped with only severely swollen eyes as a result of the g-forces he encountered during the wild gyrations of his car’s demise. The Rover was less fortunate and surprisingly did not find a buyer – except as scrap. 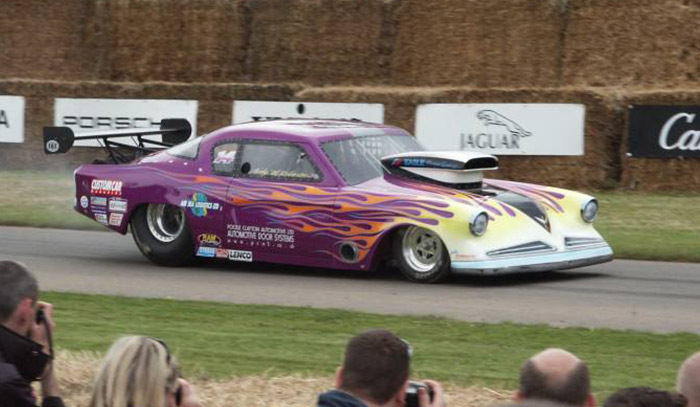 Andy campaigned his flame adorned Studebaker with no small degree of success, gaining three MSA Pro Mod Championships He also made another special guest appearance at the Goodwood Festival of Speed following an earlier, crowd wowing appearance in the Rover. But as ever, with Andy’s quest for speed he eyes turned eventually to a new mistress in the shape of his ’69 Camaro which made its debut in 2013. The car showed early promise in the following year as it dipped into to the 5.9s, but as Andy admits, it has not been an easy car to extract performance from and has taken a further three years for them to deliver that same level of performance consistently. That said it hasn’t stopped them adding another three Pro Mod championships to their tally in the interim! 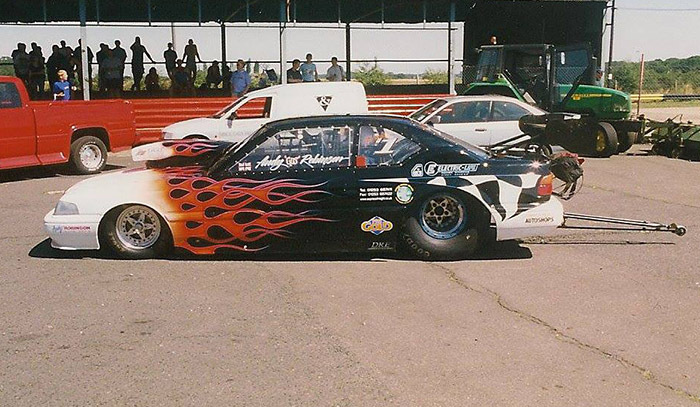 Running parallel with Andy’s stellar racing career is his other profession, that of race car builder and fabricator in the form of Andy Robinson Race Cars. Andy’s work not only extends across the world of drag racing (at the forthcoming Euro Finals for instance, Andy will be competing against three other Pro Mod cars built in his own workshops), but also across the whole spectrum of motorsport. At the time of our interview he had amongst other exotica in his workshop an F1 McLaren, not the latest model you understand. Such is his company’s reputation that there is a constant stream of customers looking to engage him and hence is workshop is normally bulging with all type of projects in various stages of completion. 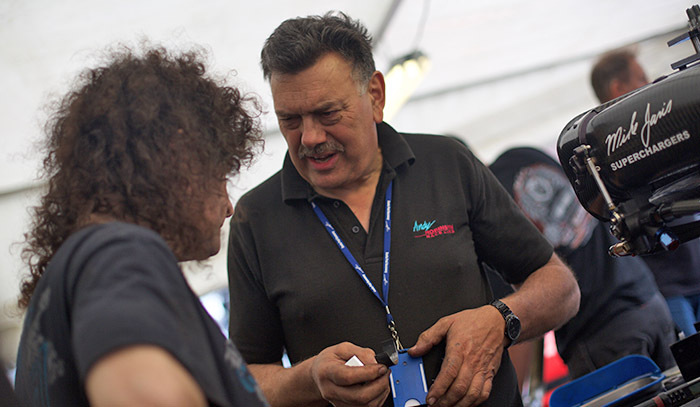 And spend anytime in the ARR garage at any race meeting and there you will also find a constant stream of not only customers, but other competitors, looking for advice and fettling of assorted components by Andy and his team. No matter than he may be facing them on track later in the day, Andy delivers his expertise equally and unreservedly. In the truest sense of the word “gentleman”, Andy is surely the very embodiment. With the 2018 season drawing to a close and only two race meeting left, Mr Robinson is in pole position to take the UK title for a seventh time. But Mr Modest is only too aware of how fortune can turn on a sixpence in the motorsport so there’s no talk of that expectation being fulfilled yet, just a quiet determination on the face of every member of the team (including son Luke, crew chief and daughter Steph). 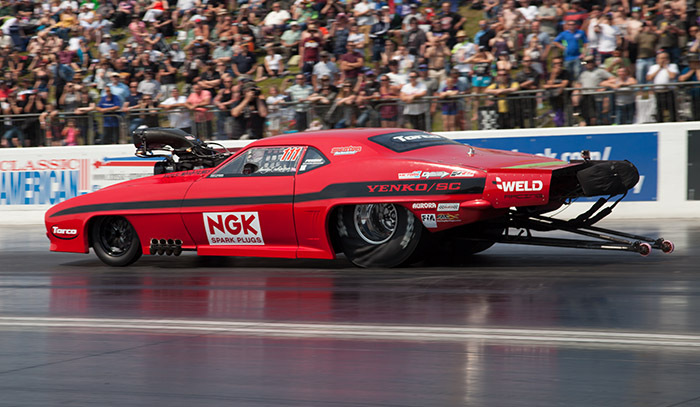 There is business yet to be done in the NGK Andy Robinson Racing Team and until it is their focus is on the coming weeks where they attempt to secure another record breaking title for Mr Pro Mod. But come what may for this season, one thing that is certain is Andy’s place amongst the greats of UK drag racing. 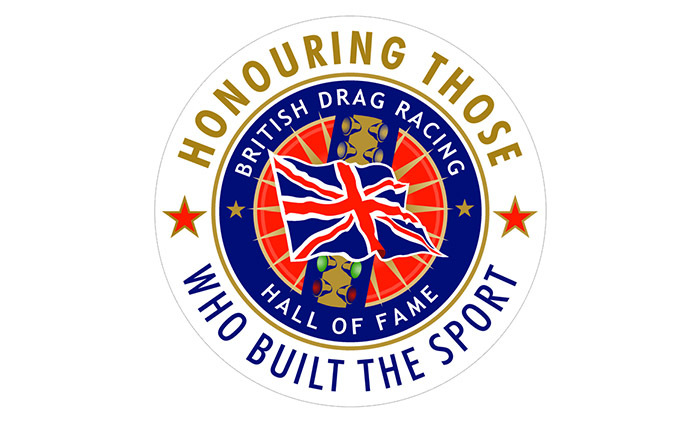 This year he received the ultimate accolade of being inducted into the British Drag Racing Hall of Fame, an accolade that by general agreement could not have gone to a more deserving recipient. Mr Pro Mod himself. Andy ‘Gus’ Robinson.